Just like any other accident, it’s important to first take anyone to the hospital who needs immediate medical attention. 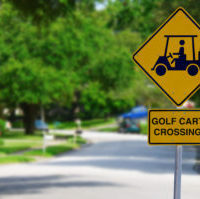 Once it’s determined that everyone is safe, call the police and take photos of the scene, the people’s injuries, the golf cart(s) involved, any other objects that may have been part of the accident. Also get contact information of anyone who may have witnessed the crash. Determining fault requires an in-depth investigation of the accident, including a professional inspection of the vehicles involved, an examination of the scene and witness interviews. This is when the police and your lawyer get to work.